Mary Achieng Onyango, a hard-working farmer and mother of two living in the North Kamagambo community in Kenya, lost her husband at a very young age to HIV. When she later tested positive, she greatly struggled to maintain her health due to the distance she had to travel to receive treatment, the fear of others knowing her status, and an abusive relationship she felt she could not escape. During that time in her life, Mary felt hopeless and her condition became critical. 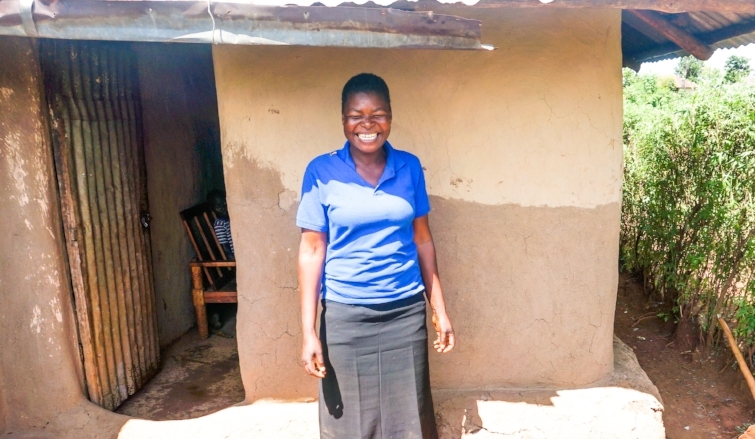 When the Lwala Community Health Centre, operated by Blood:Water's local partner Lwala Community Alliance (LCA), was opened near her home, Mary was approached by a community health worker (CHW) who spoke about the HIV/AIDS care and support she would receive upon enrollment. That interaction with the CHW was enough to change Mary’s life direction. She broke free from the harmful relationship, and through the health center, she gained specialized care and treatment, both at the hospital and in her home. Mary was also connected to a support group with other women living positively, which built up her confidence and made her feel not alone. The counseling, education, and guidance she received helped fill her with hope and a determination to live. Today is World AIDS Day, and we celebrate the progress that has been made in the international HIV/AIDS crisis. We also are reminded that there is crisis-level urgency to reach zero AIDS-related deaths, zero new transmissions, and zero discrimination. Our partners are continuing to seek out the marginalized and provide expert-level care in the communities they serve. We ask that today, you consider making a gift in honor of hope-filled stories like Mary's.